You can help make America's Brightest Orange even brighter. Oklahoma State University’s alumni and friends are the epitome of loyal and true. 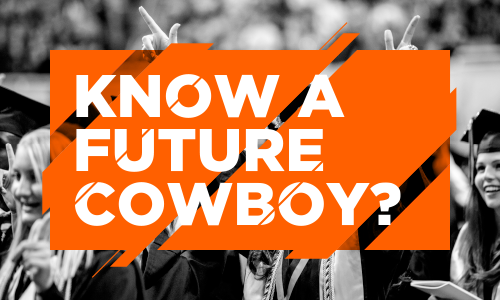 With a love of all things orange, you can help share the spirit of OSU with the next generation of Cowboys and Cowgirls! If you know a high school or transfer student that would make a great addition to the Cowboy family, please consider passing along his or her information. We’ll give them the VIP treatment and share with them what you already know — OSU is a great place to get an education with life-changing experiences. We’ll send them information about scholarships and invitations to special events on campus and in their area! Even if you don’t have information for all the boxes below, please fill in what you can. At least one contact method (address, phone number or e-mail) is required for the student so Undergraduate Admissions may contact them. The information provided will not be shared with anyone outside OSU. Thank you for taking time to help us grow our Cowboy family! Are you an OSU alum or former student? Use the field below to search for the student's high school or college. If you're having trouble locating the institution, try "HS" for high school or enter the city where it is located. What semester will the student be entering OSU?